I.11.16 Pompeii. December 2007. 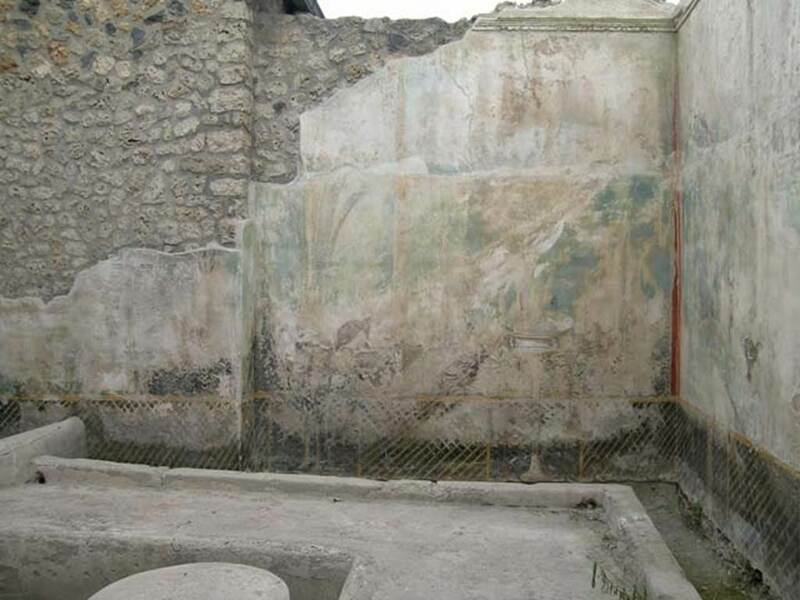 Room 6, triclinium and north wall. I.11.16 Pompeii. April 2004. Room 6, looking towards north wall. Photo courtesy of Nicolas Monteix. I.11.16 Pompeii, 1968. 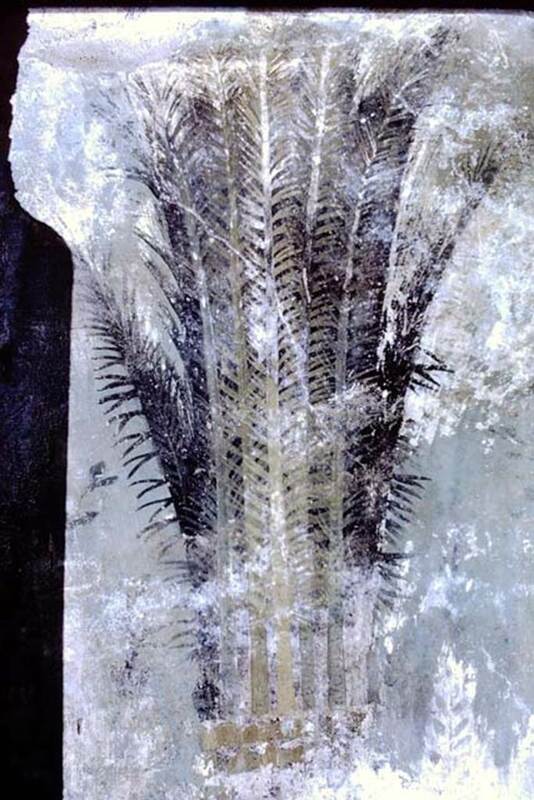 Room 6, detail of painted palm tree from north wall. Photo by Stanley A. Jashemski. I.11.16 Pompeii. December 2007. 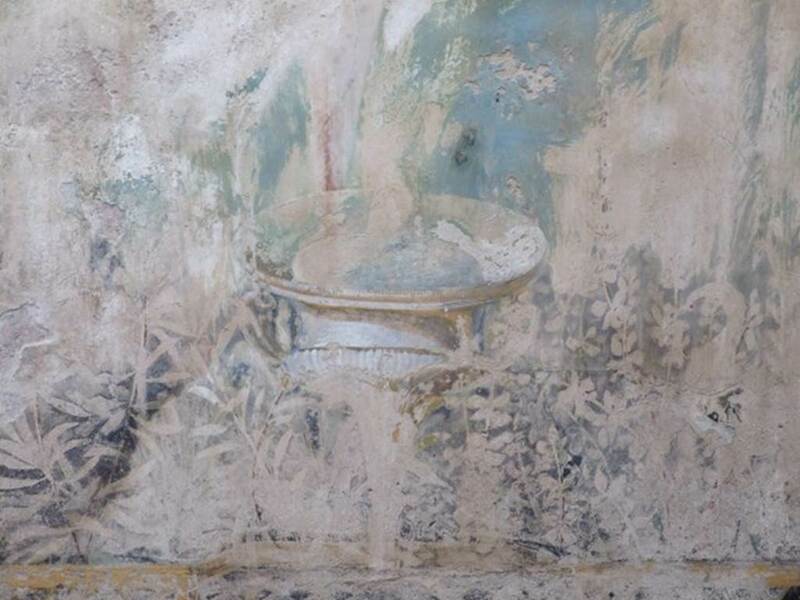 Room 6, painted garden scene with urn, from north wall. I.11.16 Pompeii. December 2007. Room 6, north wall and north-east corner with style IV garden scenes. I.11.16 Pompeii. December 2007. 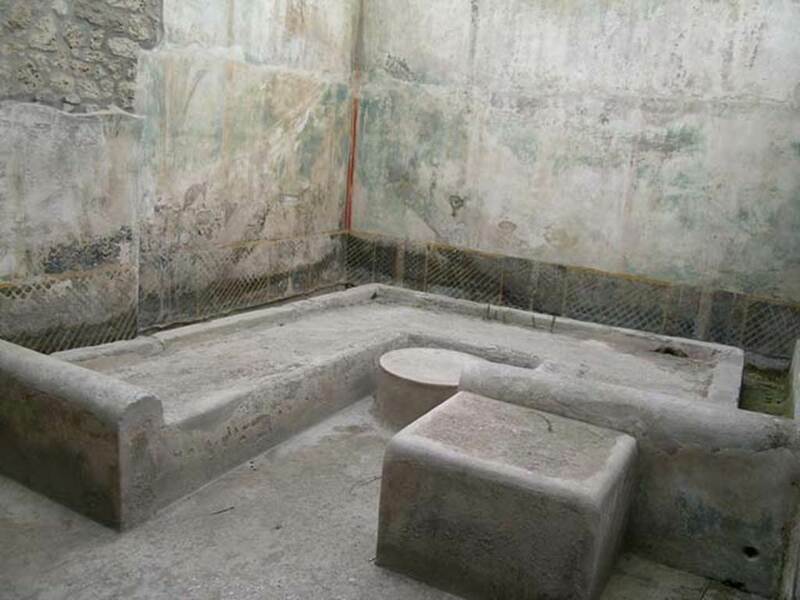 Room 6, Looking north-east across triclinium. 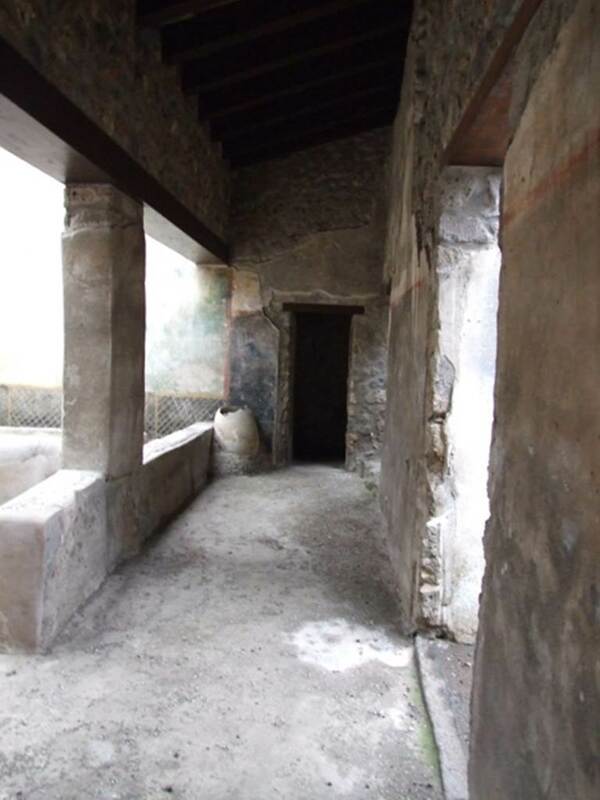 On the right of the photo is the low wall (or pluteus) separating the outdoor triclinium from the passageway room 9. According to Packer, the wall was 0.62m high. 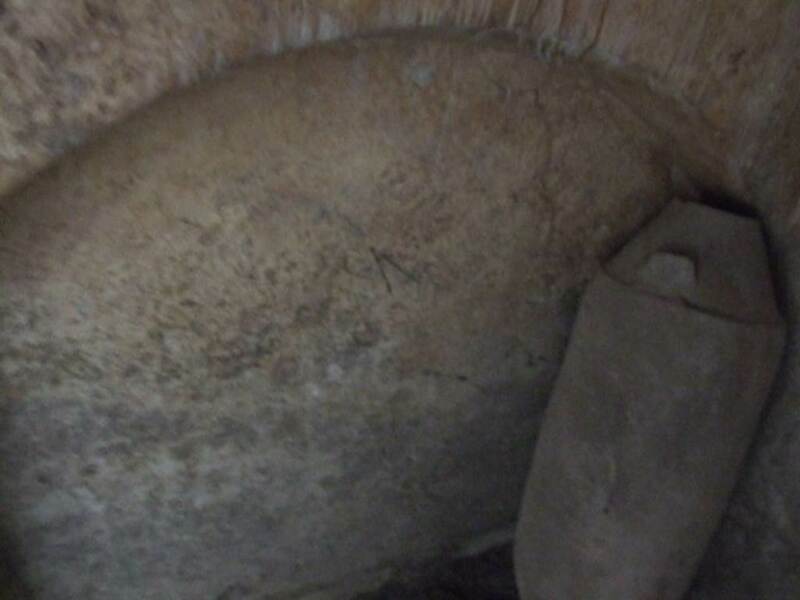 A heap of empty amphorae, stacked so that the mouths of those above enclosed the pointed end of those below, were found on the north-east corner of the triclinium, see Packer fig. 11 on page 21). Packer included the note: “This room was being excavated on July 21 1960, according to RDP. Some of the more important items found were: a fragmentary bronze patera, a broken bronze oinochoe with a trilobate mouth, three terracotta lamps and one of glass. I.11.16 Pompeii. April 2004. Looking towards the north-east corner. Photo courtesy of Nicolas Monteix. I.11.16 Pompeii. 1961. 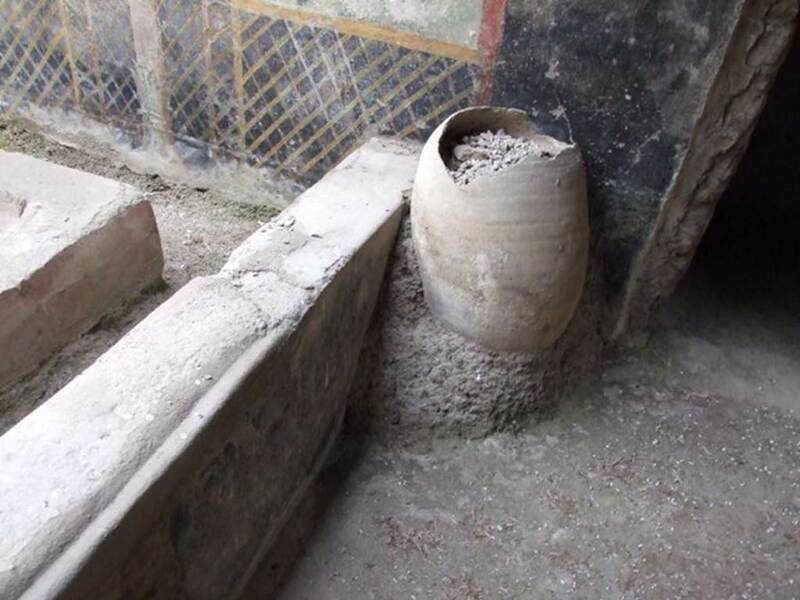 Room 6, looking towards north-east corner and heap of empty amphorae. I.11.16 Pompeii. December 2007. Room 6, east wall with painted garden scene. I.11.16 Pompeii. December 2007. 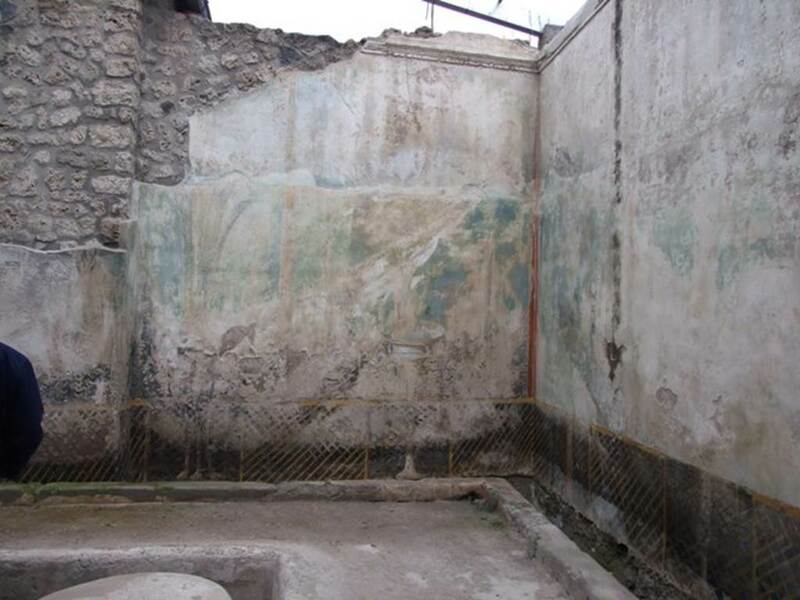 Room 6, painting of trellis on east wall of triclinium and pot at end of passageway, room 9. 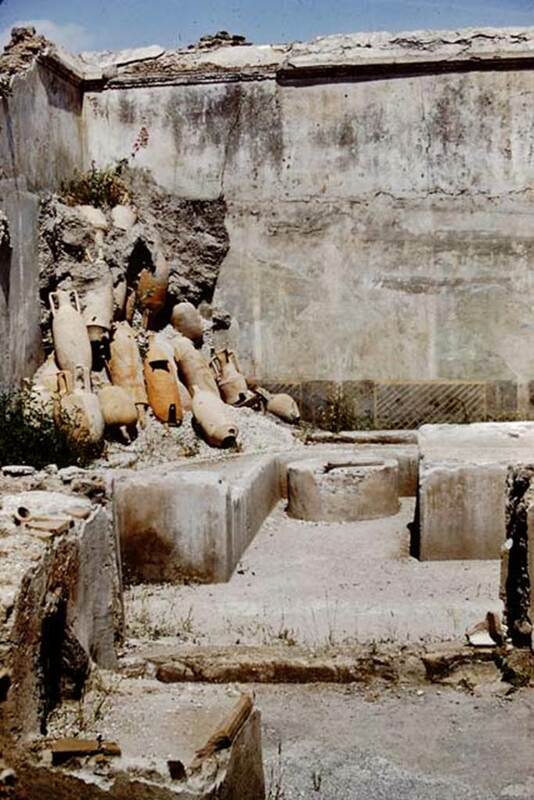 I.11.16 Pompeii. December 2007. 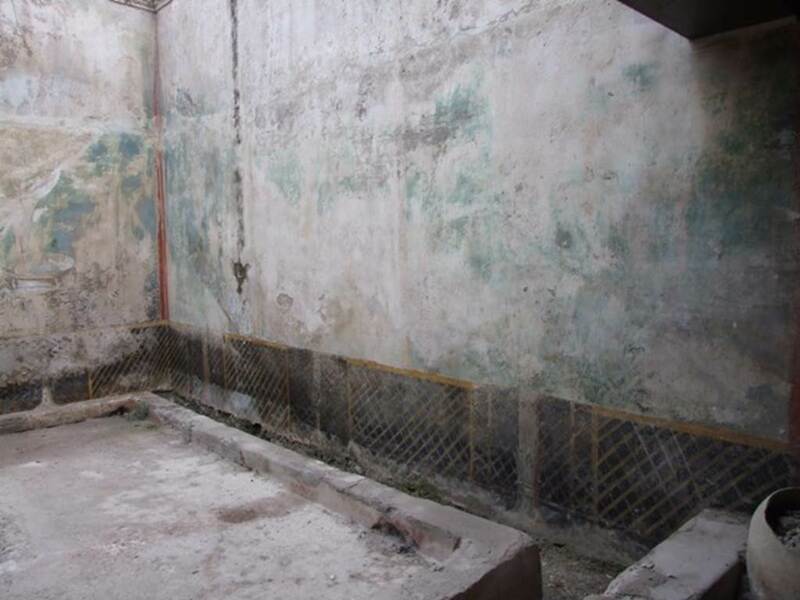 Room 9, looking east along corridor on south side of triclinium, which gave access to rear rooms. 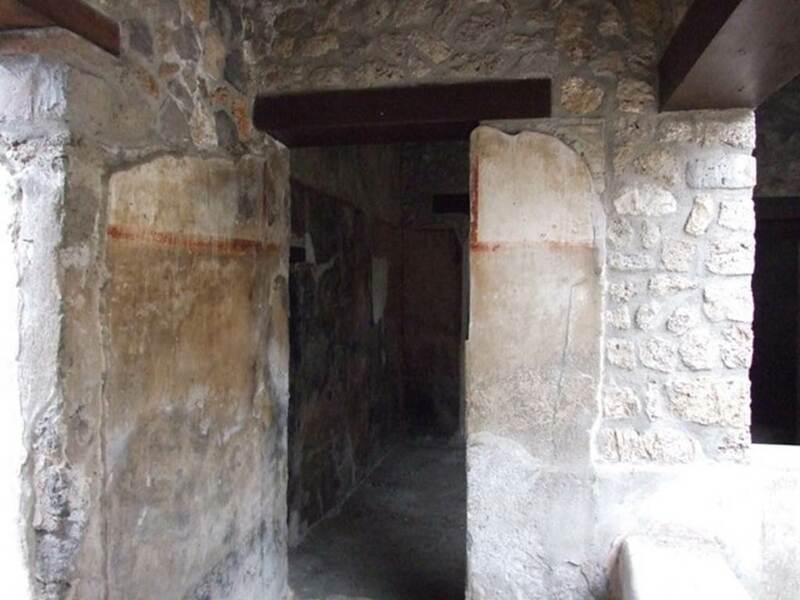 At the far end is a door leading to a small alcove, room 13, with the doorway to room 10 on its right. 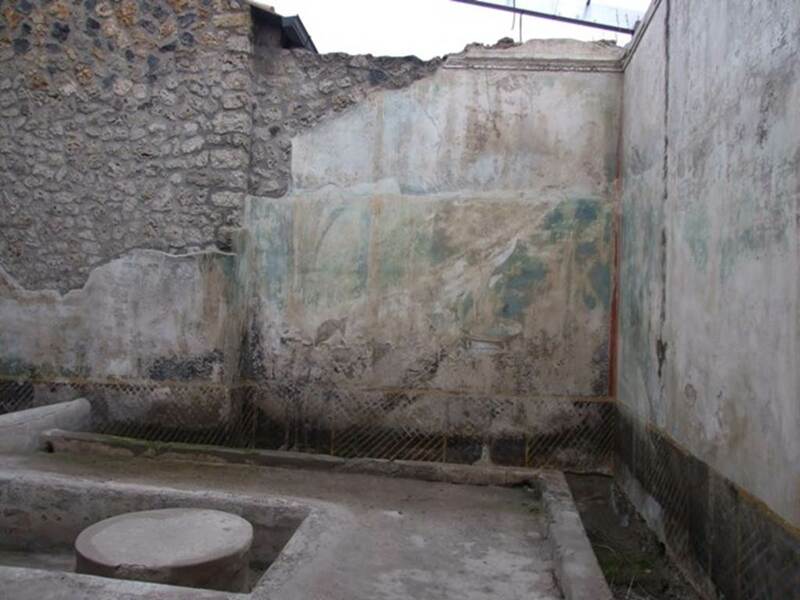 See Packer, J: Inns at Pompeii: a short survey, in Cronache Pompeiane IV-1978 (p.18-24, with note on page 22). 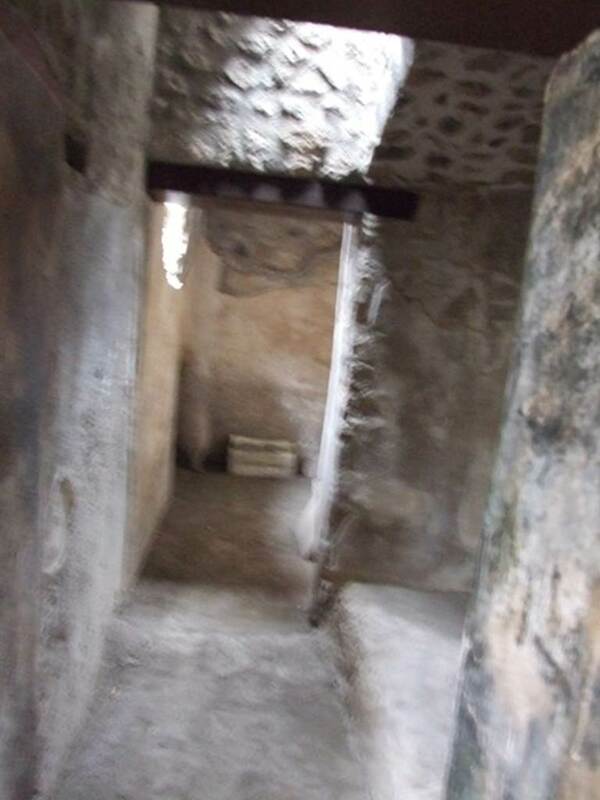 On the right is the doorway to room 7, a small hallway leading to room 7A, a small cubiculum. I.11.16 Pompeii. December 2007. 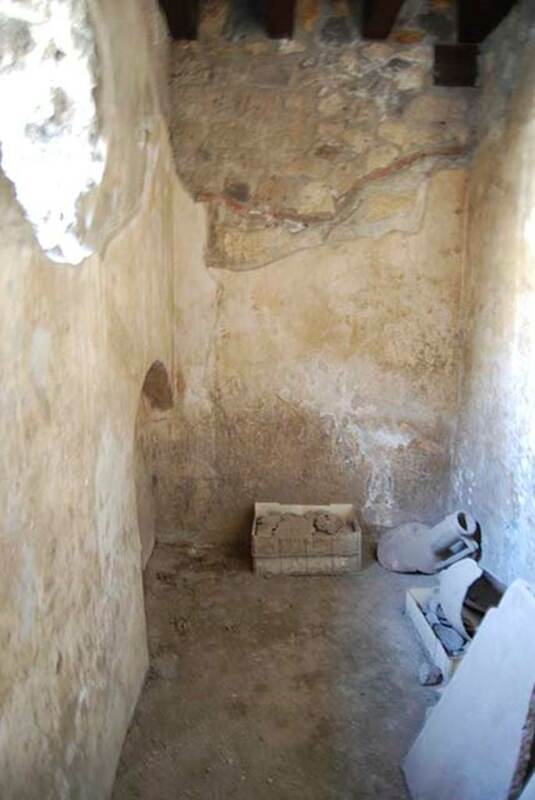 Room 13, small storeroom, cella penaria, on east side of corridor room 9. According to Packer, the original ceiling was 2.30m above the floor level. I.11.16 Pompeii. December 2007. Room 9, looking west along passageway towards room 3, the covered atrium. According to Packer, the walls of this corridor were painted, with a black dado varying in height, and red borders partitioning the white main zone into panels. I.11.16 Pompeii. December 2007. Room 7, looking south across the small hallway towards room 7A. 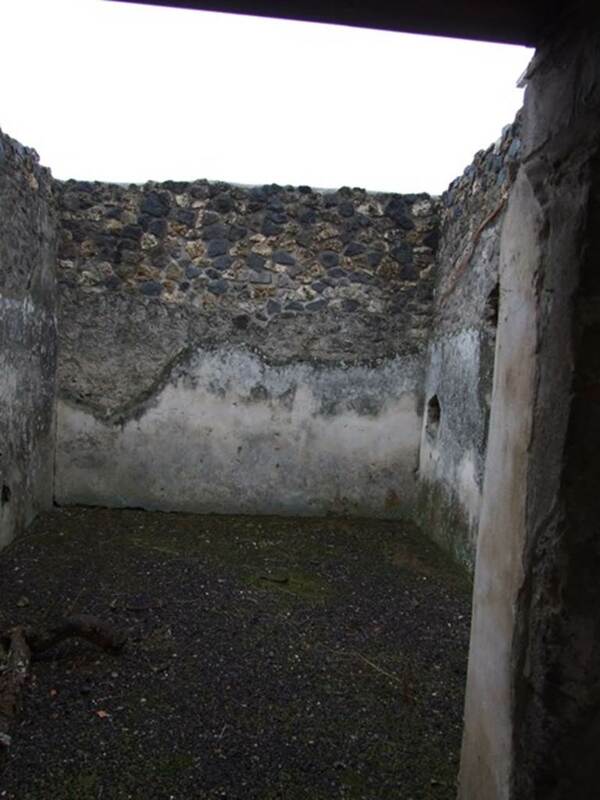 According to Packer, both of these rooms would have had walls painted with plain white stucco. I.11.16 Pompeii. December 2007. Room 7. According to Packer, the ceiling of this room was only 2.80m above the floor level. A ledge ran along the west side, and there was a small basin in the north-west corner. 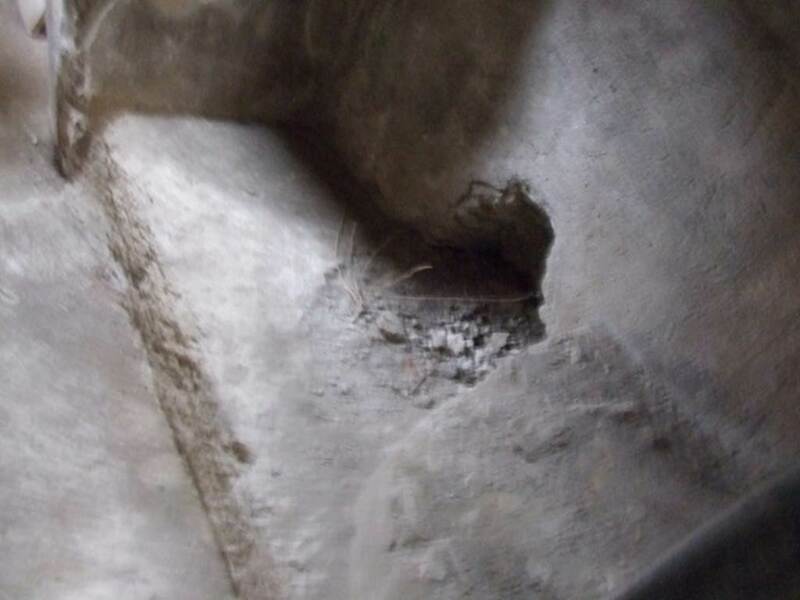 A lead pipe with only a single break apparently filled this basin with rain-water, and in the centre of the west wall behind the ledge was a triangular opening which appeared to be a drain. An arch extending the length of the hall supported the ceiling on the west side of the room. I.11.16 Pompeii. May 2103. Room 7A, looking south towards far end of room. According to Packer, the restored ceiling is 2.70m above the floor level, and there is a low arched bed niche in the south-east corner. I.11.16 Pompeii. May 2103. 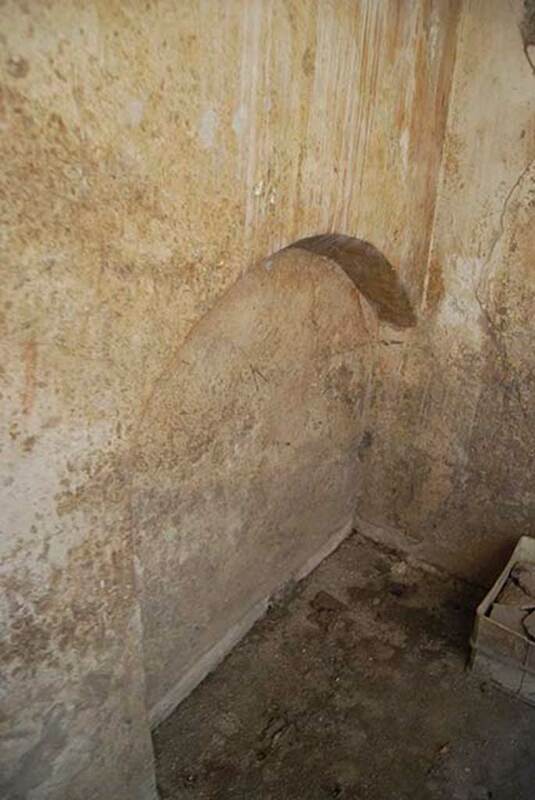 Room 7A, arched recess in south-east corner. I.11.16 Pompeii. December 2007. 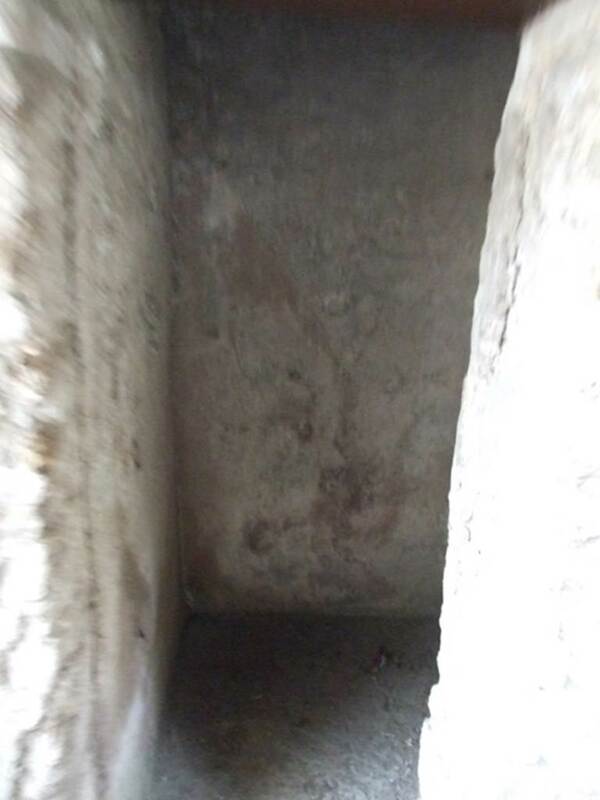 Room 7A, recess in east wall in south-east corner. I.11.16 Pompeii. December 2007. Doorway to room 8, looking east. 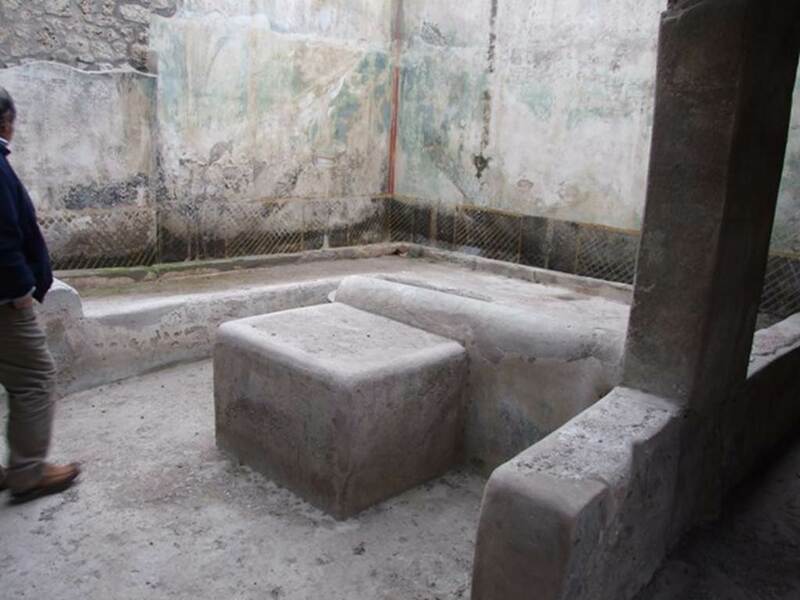 According to Packer, this may have been a winter triclinium or an oecus. The walls were painted with plain white stucco.